The Traveling Trunk Programs from the National Museum of the Marine Corps are free interactive presentations that bring a Museum Educator to your classroom or location to teach about different eras of Marine Corps History. Students get to touch and try-on different replica uniforms and feel the weight of the different items the Marines would have carried through the years. 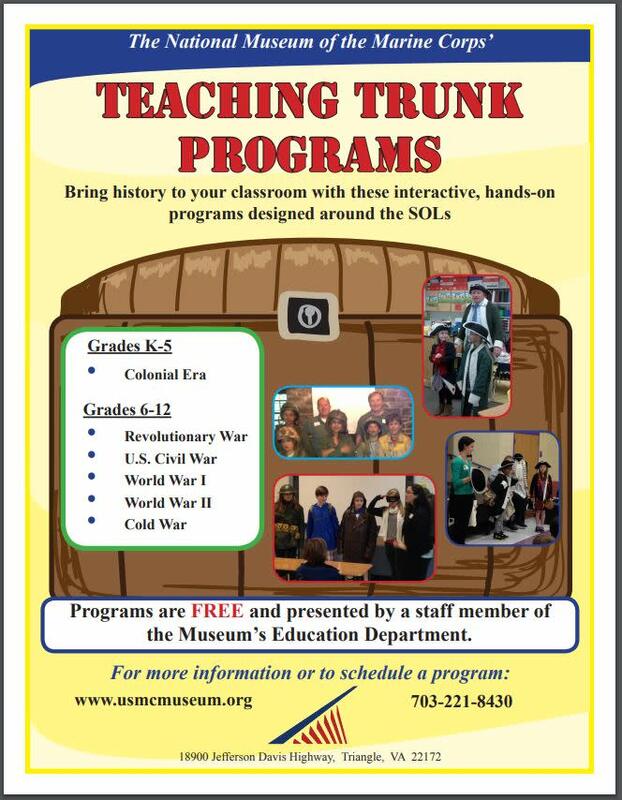 This program is a great way to bring part of the museum to your students as either a preview before a field trip or as a follow-up lesson after a visit. For Kindergarten - 5th Grade: We offer a Past and Present program that helps students explore the differences between Colonial Life and Today. For 6th-12th Grade: We offer programs for specific time periods including the Revolutionary War, Civil War, WWI, and WWII.